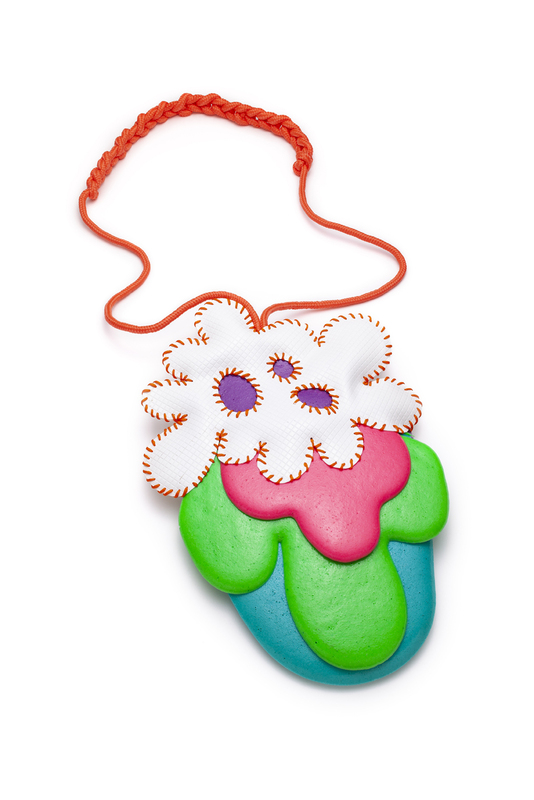 CAMEO IS AN ONGOING SERIES FEATURING CANADIAN JEWELLERY ARTISTS. HERE, THEY SHARE THEIR LATEST THOUGHTS AND INSIGHTS, AND GIVE US A PEEK INTO THEIR PRACTICE. Describe your current work/practice in one sentence. My practice is a playful journey through colours, forms and materials; experimenting and combining various methods and styles to create an interaction (and a reaction) between the artist, the wearer and the public. What are three things/ideas that inspire you? Pushing the boundaries, exploring. I’m curious about everything! What other things do you do besides your jewellery practice? Well, I do a lot of things in general, where do I start?! I teach jewellery and also give workshops on how to integrate Plexiglas and resin in contemporary jewellery at the Westmount Visual Art Centre and at the Jewellery School of Montreal. I also teach jewellery classes in youth centres and now in an African women’s centre. I also own two little public market stands where I make and sell fresh juices, smoothies and ice cream in summer, and mainly maple products in winter and some products from the family farm. My parents started an organic farm about eight years ago and now with my two brothers we are trying to find a way to develop it together. I also started a project of sculptures with my dad who is an artist too, mainly for our own pleasure, but it would be interesting to do an exhibition! I’m passionate about projects. I’m a bit crazy, always looking for something to develop or do. If you are looking for someone to do a project with, here I am! Always willing! I can’t say I have just one. I have two. The first ones are the Funky wave rings 1 and 2, because they started my love story with acrylic and push me into that direction. 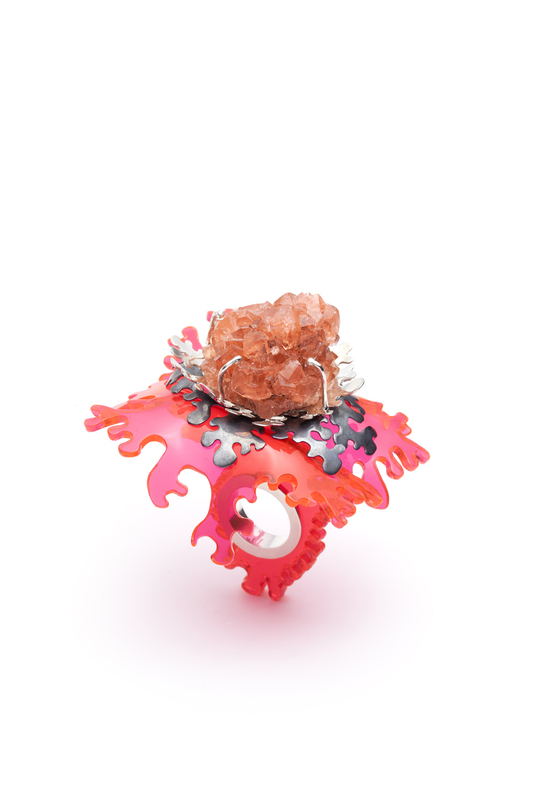 The Funky ring #2 was finalist at my first international contest (Niche Student Awards) when I was still studying and was used in all the publicity for the Jewellery School of Montreal and the Cégep du Vieux-Montréal. That ring exhibited a lot before it was sold in one of my studio sales. The second one is the “Somebody got crazy with the candy machine” necklace. That necklace gave the name to the collection and express well my crazy creativity. What is a favourite piece that you’ve made and why? I feel we have a strong and creative jewellery scene in Canada but that it’s not well known by the population! We have a lot of unique approaches in jewellery. There something about Canadian jewellery that is really fun, colourful and pop. What word pops into your mind when you think of Canadian art jewellery? I’ll be having my first solo exhibition in Montréal, from November 30th, 2018 to February 17th, 2019 at the gallery La Guilde, which I’m really excited about. I will present about 10 new pieces. I took a year off teaching my regular classes to have more time for me. I’m looking forward to spending more time with my family and also starting a new body of work. I’ve had some ideas in my head for a year now and I just need time to sit and explore them. I’m also thinking about a collaboration project. What is coming up next for you? Sign up to receive our monthly newsletter, which includes information on national & international calls for entry, upcoming exhibitions, reviews, featured artists and more! The MetalAid team respects your privacy. Thank you for subscribing. Thank you for joining our newsletter and welcome to the MetalAid Network.